Close your eyes and imagine for a moment that you have, somehow, lost the use of your arms, or legs, or eyes. How would that feel? What would it be like to lose those central parts of yourself? Or worse, what would it be like if you were forced not to use them? To have your arms tied, legs bound or eyes covered. This is what I imagine is being felt by people who are having their freedom of religion restricted. I imagine that it feels as if someone were taking away a part of you. Religion is something that brings so much good to society as well as to our own lives. A Heritage Foundation article by Patrick F. Fagan entitled Why Religion Matters Even More: The Impact of Religious Practice on Social Stabilityoutlines many positive benefits of religion, such as better parent-child relationships, marital harmony and satisfaction, and improved levels of general well-being and happiness, among others. 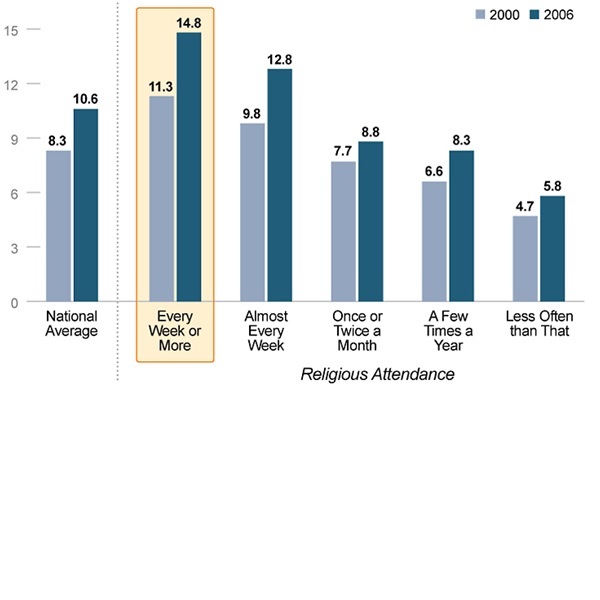 This graph from FamilyFacts.org shows how religious individuals that attend church on a weekly basis spend more time volunteering than others. Religion and the freedom to practice our religions helps establish a society full of caring and involved citizens who are active in their communities. Other graphs from the same cite show a positive relationship between religious attendance and charitable giving. Religion is an unquestionable assets to our societies, but there has been a noticeable increase in the number of Americans who claim no religious affiliation, according to FamilyFacts.org. Religious views and church attendance is falling fast and with it, religious tolerance. When we think about religious freedom in this country, we might think of the pilgrims in their quest to find a place where they could worship freely, or we may consider the Declaration of Independence and the God given rights declared to the American people of life, liberty, and the pursuit of happiness. Despite these strong images, there are high levels of religious intolerance in this country and an under-appreciation for the traditionally held religious beliefs that it was founded on. We the people have so much in terms of freedom, but the trouble I see is that we are less concerned about freedom of religion than we are about freedom from religion. Increasingly, our government and society are becoming less tolerant of individuals expressing and acting on what they believe. We have a mentality that “religion is meant to be left at home where it cannot bother anyone”. We see current example in the healthcare mandates with regards to birth control. Religious Americans believe that their religion is an integral part of who they are as a person, and explains the struggles they are facing when it comes to government policies that conflict with religious beliefs. We should not have a “what happens at church stays at church” attitude about our own and others’ faiths. This is not what our Founding Fathers had in mind when they worked so hard to establish a country free from religious tyranny and oppression, as stated in the Declaration of Independence. These inspired men did not want the separation of church and state to create a chasm between government and religion, but instead meant for it to create security for all citizens to have the right to worship as they chose and to act on and express their religious beliefs as they saw fit, within the confines of the law. I believe they saw a country in which all its citizens could come together, with differing religious and personal beliefs and collectively contribute to the common good and development of this country. Sadly, instead of this vision of religious freedom, we are facing a reality where people are being forced to abandon their religious convictions to avoid serious consequences from both the government and society. These consequences, in an effort to protect civil liberty, are taking a serious toll on religious liberty. I ask you to consider, is either one of these precious rights less important that it should be sacrificed to the will of the other? No. Yet more and more we are seeing cases where businesses and other service providers are being subjected to fines and penalties because they refuse service based on their individually held religious beliefs, such as in this case involving a photographer refusing to photograph a commitment ceremony. It seems difficult, but there must be something that can be done to protect the freedom of religion that makes our country wonderful, while at the same time uphold individuals’ rights against discrimination. One thing that each of us can do is be less afraid of offense and be more open to cooperation. We should have love and respect for all members of our society, but should not be forced to leave our religion behind in the dust in order to avoid confrontations and enforced consequences. A college professor of mine, during his time as a marriage and family counselor, has had individuals and families approach him in search of counseling who made lifestyles choices that did not reflect his personal beliefs and which he was not comfortable in working with. Instead of telling these individual that he could not, according to his religious beliefs and conscience, take them on as clients, he politely and respectfully explained that his personal beliefs, which were very important to him, would not allow him to give them the kind of service that they were in need of and he suggested a different counselor that would better meet their needs. These families were grateful and gladly took his recommendation for another counselor. Perhaps this situation is not comparable to all others involved in religious vs. civil rights issues, but a similar attitude could help in all cases. We can fight for our religious freedoms without causing or taking offense. We should look to the teachings of our various religions, or reflect upon our deeply rooted moral convictions, to decide if the way that we conduct ourselves as we stand up for our religion is in line with the beliefs that we are standing up for. There is no point to having religious freedom if we can’t respect the beliefs of all people. We should not be forced to go against our moral convictions for any reason, and we should not leave our religion behind chapel doors. But just as importantly, we should not let the deep love and commitment that we feel for our religions get in the way of the brotherhood that we should feel as citizens of this great country and as children of a god, no matter how we choose to believe in Him. 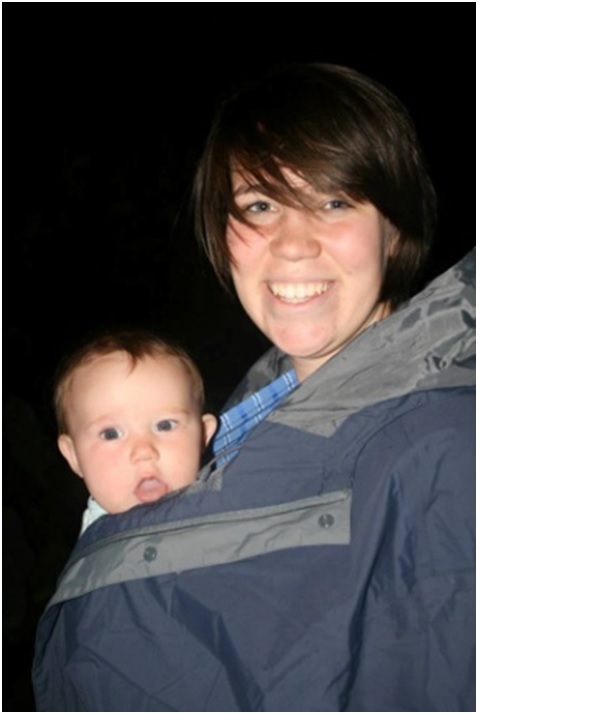 Emily Knowles is a senior at BYU-Idaho studying Child Development. She’s been married for three years and Emily and her husband have a beautiful one year old girl named Kerrigan. Emily has ambitions to become a childbirth educator and wants to help and support families as they welcome new souls into the world.